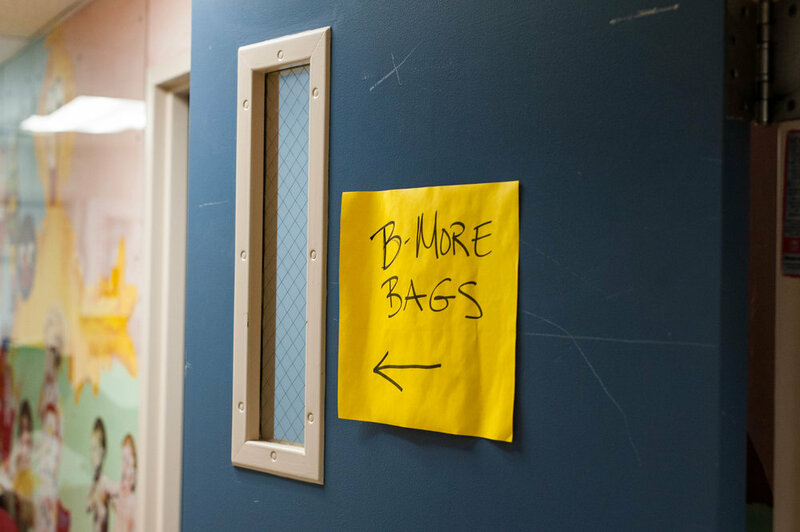 On a Saturday morning in early March, I found myself winding through the basement hallways of a building in Northeast Baltimore, looking for the home of B-More Bags. After several doorways, a simple yellow sign with an arrow told me that I was near my destination. Down a short ramp I walked into the small but orderly studio bursting with rolls and stacks of fabric, boxes of buttons and trimmings, rolls of ribbon and spools of thread. One would be overwhelmed if not for the uber-organization of the 12+ women who make up this little-known volunteer group. 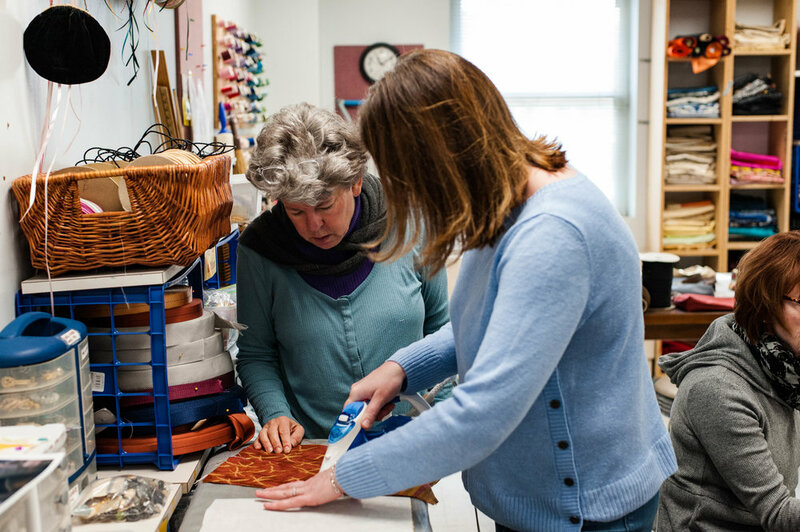 In 2005, nearly ten years into her career with the organization, she was brainstorming creative ways to fundraise and, after several iterations, developed the idea of making bags to be sold once a year at the holidays. B-More Bags made $1,500 that year. They began holding trunk shows the following year, made $4,500 and $7,500 in 2006 and 2007 respectively, and to date have raised over $60,000 for the women of House of Ruth Maryland. 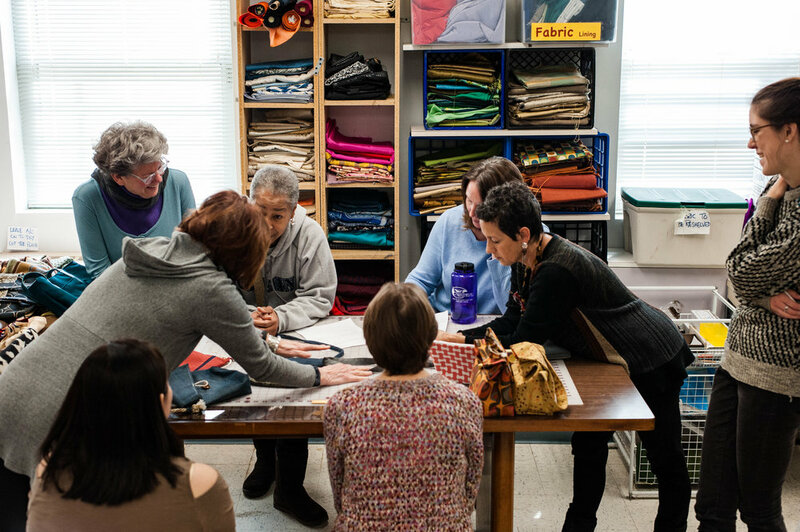 I learned of the group through my coworker, Megan, who began volunteering 8 years ago as the result of a Google search for “sewing volunteer opportunities.” The day of my visit they were holding a design workshop, during which time they would come up with the designs and patterns for the year. Designs are chosen based on several factors: what has sold well in previous years, how difficult is it to make, do we like to make it, do we have the supplies? Bags vary in price from $12 for card cases and pencil holders to $125 for large shoulder bags. Designs are also chosen by looking at the time it takes versus the price they can reasonably ask - if a bag is complicated but would sell for a low price point, the design is nixed. There are typically around 5 sales each year, concentrating in December to make the most of the holiday market. Sometimes they utilize a spring luncheon to both sell the remaining year’s inventory and to test the newer designs to see what sells. Occasionally they will find a store who is willing to sell bags, such as jewelry bags, without taking a cut. Terri told me that she hopes to collaborate with the business departments of local universities to get students in sales and marketing to help generate new sale mechanisms. Workshops are held throughout the year on Saturdays for potential new volunteers to learn about B-More Bags. If they decide to join, they are partnered with a seasoned volunteer who can teach them the process. The entire process is on display at the design workshop. 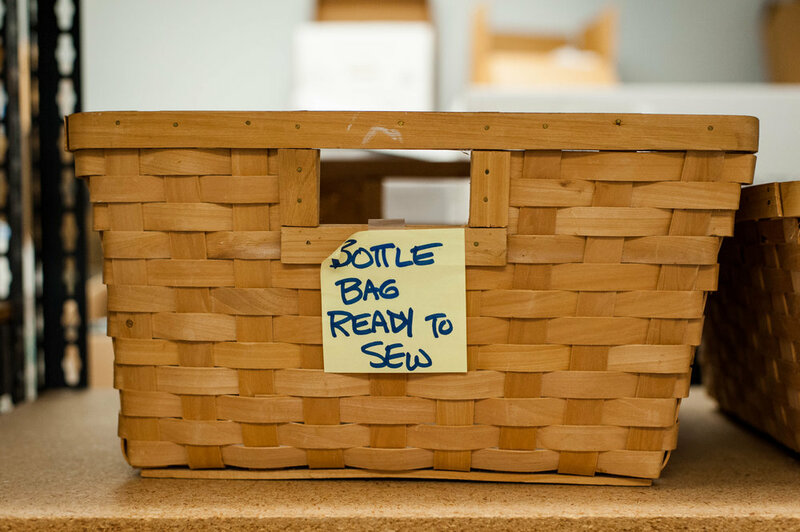 The participating women made sample bags at home and bring them in to discuss with the rest of the group. Terri and Megan facilitate the day, keeping everyone on task and taking notes to use while making later decisions. Each person presents their bag and the group talks about the merits and potential changes. Once a design is approved, it will get a champion who makes the pattern, then another person will do a test sew to see if the pattern makes sense. The parts for each pattern and each bag are cut and put into a kit by Terri, who does not sew, and who affirms “Most sewers don’t like to cut.” Kits can be checked out to be sewn at home, or done during studio hours, and once complete are evaluated with a quality check and final prep for upcoming sales. Several new designs were on display this particular morning. Janet kicked off the session by presenting a carry-all bag. A lively discussion ensued to determine what the specific use was (beach? farmer’s market? ), the best way to attach the straps (grommets? buttons? ), and the materials required. Designs are preferred that can use donated materials rather than having to procure new ones, however, if new materials are required, they are priced out to decide if it is worth it. Nearly all of the fabric, thread, buttons, etc. are donated and they rarely have to solicit additional materials. Next, Marjorie showcased her original idea of a yoga backpack. It is made with enough room for blocks and a towel, with a water bottle pouch on the side and a flap on the bottom to slide a yoga mat. Everyone (including myself!) was really excited at this new idea. What else could go in it? When is the best time to market it? How many designs should we do (colors/fabric)? The design is a go. Several other ideas are presented over the next couple hours, including a shoulder bag, a lunch bag, and an evening bag. Chris shows the group three different evening bag prototypes, each with a slightly different angle and handle to determine what is the most comfortable to hold, and the most attractive. I’m struck by the adornments on them. “We are known for our buttons!” Chris explains. As the group wraps up discussion, they go over all the presented designs and variations with pricing - making sure they have a range of prices to offer. Women volunteer to test out patterns and some stay to work on different sewing techniques, helping each other out to teach and to learn. I ask Terri, who retired in 2016, what drives her to stay involved with B-More Bags. “This is my community,” she says, describing the personal gratification she gets from the work, the relationships with other volunteers and the knowledge that they are helping the women from House of Ruth. The way the group has run has changed some over the past 13 years. Four years ago they formed a coordinating group to have a broader leadership base and a more sustainable structure. They have partnered with students from MICA to develop graphics for a logo and sales tag and hope to continue these student partnerships for areas including sales forecasting and graphic mood boards. It’s hard not to be infected by the enthusiasm of all the women at B-More Bags. They have a passion for their craft, heightened by the knowledge of the good it is doing in the world. I left that day with the desire to go home to create and to serve. Thank you to Phyllis, Catherine, Caitlin, Chris, Marjorie, Michelle, Debbie, Megan, Janet, and Terri for allowing me to join and photograph them! To find out more about B-More Bags or to apply as a volunteer, visit here. House of Ruth Maryland began in 1977 by a coalition of groups as a safe space for domestic violence victims. They provide services including housing, health and wellness services, on-site health clinic, legal services, counseling, and a 24/7 hotline. They also provide education and training about domestic violence to the broader community to increase the network of advocates. For more information visit their website. In 2011, looking for other ways to increase profits and provide more value to House of Ruth Maryland, Terri started Ruth’s Closet, a clothing consignment store on Reisterstown Road in Owings Mills. It is open 5 days a week.